It comes as no surprise to geographer Chris Funk that East Africa has been particularly hard hit with back-to-back droughts this year and last. In fact, he and colleagues at the UC Santa Barbara /U.S. Geological Survey's Climate Hazards Group (CHG) predicted the area's 2014 event based the increasing differential between extremely warm sea surface temperatures in the west and central Pacific Ocean. Now with the same data set, CHG scientists have confirmed not only that this temperature differential is a leading indicator of drought in southern Ethiopia, Kenya and northeastern Tanzania but also that extremely warm west Pacific temperatures, which contributed to the 2014 drought and recent rainfall declines in the region, would not be possible without climate change caused by human activity. Their findings appear in a special issue of the Bulletin of the American Meteorological Society, which examines annual extreme weather events to evaluate evidence of climate change. "In our paper, we argue that exceptionally warm western Pacific sea surface temperatures—SSTs—contributed to East Africa's 2014 drought and that these exceptionally warm SSTs were possible only under climate change conditions," said Funk, the CHG's research director and a research geographer with the U.S. Geological Survey. "We predicted this drought and are currently working very closely with the U.S. Agency for International Development—USAID—to monitor and quantify the ongoing dry conditions that continue to hammer many locations in Ethiopia." Making use of a data set they published earlier this month in the journal Scientific Data, UCSB researchers and colleagues from Florida State University pooled their station archives and expertise to produce a high-quality precipitation data set for East Africa. It shows that the region is drier than ever. The information was developed to support humanitarian relief agencies, East African climate adaptation efforts and the climate science community's need for high-quality up-to-date rainfall estimates. According to Funk, these two papers taken together document a very disturbing decrease in spring rainfall in East Africa. Over the past 15 years, the region has been struck by eight droughts—events that have been associated with the 2011 Somali famine and increases in the frequency of extremely low-birth-weight children. In fact, CHG investigators and colleagues at the University of Utah documented this low-birth-weight relationship in a paper published in September in the journal Global Environmental Change. 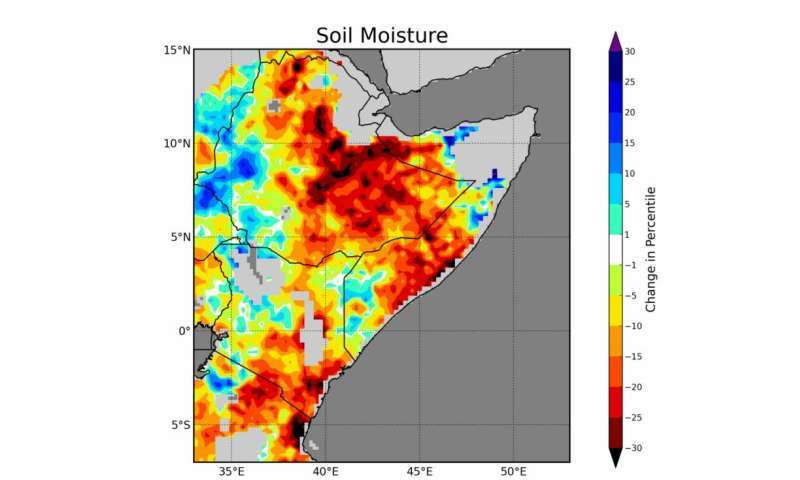 Using hydrological model simulations, the current Bulletin of the American Meteorological Society paper demonstrates that the past 15 years in East Africa have been extremely dry. Those simulations coupled with statistical analyses indicate that about half of the warming that triggered the area's 2014 drought can be attributed to human activity. "Because of droughts in 2014 and 2015, parts of south central Ethiopia may be facing serious food insecurity," said Funk, who is also an affiliated research professor in UCSB's Department of Geography. "Our research suggests that anthropogenic warming in the west Pacific may be making these droughts more frequent, so that a one-in-five-year drought now seems to be happening every four years or so. This increase in drought frequency reduces food supplies and incomes for millions of Africans, giving them less of a chance to recover and prosper, which helps feed a cycle of poverty." Funk noted that attributing the 2014 East African drought to exceptionally warm sea surface temperatures helps trace the "fingerprint" of climate change on seasonal timescales and puts the event in a historic context. However, the news is not all bad. CHG research demonstrates that these recent droughts may offer some basis for predictability: The CHG has already told USAID about concerns for 2017 if La Niña conditions follow the current El Niño. The CHG works closely not only with African counterparts to improve climate services and forecasts but also with the Famine Early Warning Systems Network (FEWS NET), an organization created by USAID in 1985 after the devastating famines in East and West Africa. "For the past 13 years or so, we've continued to both refine and improve our rainfall data sets as well as our understanding of what drives these droughts," Funk concluded. "We've gone from identifying droughts to understanding what we think is forcing the droughts to now trying to—sometimes at least—predict the droughts."